The serotonin 1A receptor (or 5-HT1A receptor) is a subtype of serotonin receptor (5-HT receptor) that binds the neurotransmitter serotonin (5-hydroxytryptamine, 5-HT). It is a G protein-coupled receptor (GPCR), coupled to the Gi protein, that mediates inhibitory neurotransmission. The serotonin 1A receptor is encoded by the HTR1A gene. 5-HT1A receptor agonists are involved in neuromodulation. They decrease blood pressure and heart rate via a central mechanism, by inducing peripheral vasodilation, and by stimulating the vagus nerve. These effects are the result of activation of 5-HT1A receptors within the rostral ventrolateral medulla. The sympatholytic antihypertensive drug urapidil is an α1-adrenergic receptor antagonist and 5-HT1A receptor agonist, and it has been demonstrated that the latter property contributes to its overall therapeutic effects. Vasodilation of the blood vessels in the skin via central 5-HT1A activation increases heat dissipation from the organism out into the environment, causing a decrease in body temperature. Activation of central 5-HT1A receptors triggers the release or inhibition of norepinephrine depending on species, presumably from the locus coeruleus, which then reduces or increases neuronal tone to the iris sphincter muscle by modulation of postsynaptic α2-adrenergic receptors within the Edinger-Westphal nucleus, resulting in pupil dilation in rodents, and pupil constriction in primates including humans. 5-HT1A receptor agonists like buspirone and flesinoxan show efficacy in relieving anxiety and depression, and buspirone and tandospirone are currently approved for these indications in various parts of the world. Others such as gepirone, flesinoxan, flibanserin, and naluzotan have also been investigated, though none have been fully developed and approved yet. Some of the atypical antipsychotics like lurasidone and aripiprazole are also partial agonists at the 5-HT1A receptor and are sometimes used in low doses as augmentations to standard antidepressants like the selective serotonin reuptake inhibitors (SSRIs). 5-HT1A autoreceptor desensitization and increased 5-HT1A receptor postsynaptic activation via general increases in serotonin levels by serotonin precursor supplementation, serotonin reuptake inhibition, or monoamine oxidase inhibition has been shown to be a major mediator in the therapeutic benefits of most mainstream antidepressant supplements and pharmaceuticals, including serotonin precursors like L-tryptophan and 5-HTP, selective serotonin reuptake inhibitors (SSRIs), serotonin-norepinephrine reuptake inhibitors (SNRIs), tricyclic antidepressants (TCAs), tetracyclic antidepressants (TeCAs), and monoamine oxidase inhibitors (MAOIs). 5-HT1A receptor activation likely plays a significant role in the positive effects of serotonin releasing agents (SRAs) like MDMA ("Ecstasy") as well. 5-HT1A receptors in the dorsal raphe nucleus are co-localized with neurokinin 1 (NK1) receptors and have been shown to inhibit the release of substance P, their endogenous ligand. In addition to being antidepressant and anxiolytic in effect, 5-HT1A receptor activation has also been demonstrated to be antiemetic and analgesic, and all of these properties may be mediated in part or full, depending on the property in question, by NK1 receptor inhibition. Consequently, novel NK1 receptor antagonists are now in use for the treatment of nausea and emesis, and are also being investigated for the treatment of anxiety and depression. 5-HT1A receptor activation has been shown to increase dopamine release in the medial prefrontal cortex, striatum, and hippocampus, and may be useful for improving the symptoms of schizophrenia and Parkinson's disease. As mentioned above, some of the atypical antipsychotics are 5-HT1A receptor partial agonists, and this property has been shown to enhance their clinical efficacy. Enhancement of dopamine release in these areas may also play a major role in the antidepressant and anxiolytic effects seen upon postsynaptic activation of the 5-HT1A receptor. Activation of 5-HT1A receptors has been demonstrated to impair certain aspects of memory (affecting declarative and non-declarative memory functions) and learning (due to interference with memory-encoding mechanisms), by inhibiting the release of glutamate and acetylcholine in various areas of the brain. 5-HT1A activation are known to improve cognitive functions associated with the prefrontal cortex, possibly via inducing prefrontal cortex dopamine and acetylcholine release. Conversely, 5-HT1A receptor antagonists such as lecozotan have been shown to facilitate certain types of learning and memory in rodents, and as a result, are being developed as novel treatments for Alzheimer's disease. 5-HT1A receptor activation induces the secretion of various hormones including cortisol, corticosterone, adrenocorticotropic hormone (ACTH), oxytocin, prolactin, growth hormone, and β-endorphin. The receptor does not affect vasopressin or renin secretion, unlike the 5-HT2 receptors. It has been suggested that oxytocin release may contribute to the prosocial, antiaggressive, and anxiolytic properties observed upon activation of the receptor. β-Endorphin secretion may contribute to antidepressant, anxiolytic, and analgesic effects. 5-HT1A receptors can be located on the cell body, dendrites, axons, and both presynaptically and postsynaptically in nerve terminals or synapses. Those located on the soma and dendrites are referred to as somatodendritic, and those located presynaptically in the synapse are simply referred to as presynaptic. As a group, receptors that are sensitive to the neurotransmitter that is released by the neuron on which the receptors are located are known as autoreceptors; they typically constitute the key component of an ultra-short negative feedback loop whereby the neuron's release of neurotransmitter inhibits its further release of neurotransmitter. Stimulation of 5-HT1A autoreceptors inhibits the release of serotonin in nerve terminals. For this reason, 5-HT1A receptor agonists tend to exert a biphasic mode of action; they decrease serotonin release and postsynaptic 5-HT1A receptor activity in low doses, and further decrease serotonin release but increase postsynaptic 5-HT1A receptor activity at higher doses by directly stimulating the receptors in place of serotonin. This autoreceptor-mediated inhibition of serotonin release has been theorized to be a major factor in the therapeutic lag that is seen with serotonergic antidepressants such as the SSRIs. The autoreceptors must first desensitize before the concentration of extracellular serotonin in the synapse can become elevated appreciably. Though the responsiveness of the autoreceptors is somewhat reduced with chronic treatment, they still remain effective at constraining large increases in extracellular serotonin concentrations. For this reason, serotonin reuptake inhibitors that also have 5-HT1A receptor antagonistic or partial agonistic properties, such as vilazodone and SB-649,915, are being investigated and introduced as novel antidepressants with the potential for a faster onset of action and improved effectiveness compared to those currently available. Unlike most drugs that elevate extracellular serotonin levels like the SSRIs and MAOIs, SRAs such as fenfluramine and MDMA bypass serotonin autoreceptors such as 5-HT1A. They do this by directly acting on the release mechanisms of serotonin neurons and forcing release to occur regardless of autoreceptor-mediated inhibition. As such, SRAs induce immediate and much greater increases in extracellular serotonin concentrations compared to other serotonin-elevating agents such as the SSRIs. In contrast to SRAs, SSRIs actually decrease serotonin levels initially and require several weeks of chronic dosing before serotonin concentrations reach their maximal elevation and full clinical benefits for conditions such as depression and anxiety are seen. For these reasons, selective serotonin releasing agents (SSRAs) such as MDAI and MMAI have been proposed as novel antidepressants with a putatively faster onset of action and improved effectiveness compared to current treatments. Similarly to SRAs, sufficiently high doses of 5-HT1A receptor agonists also bypass the 5-HT1A autoreceptor-mediated inhibition of serotonin release and therefore increase 5-HT1A postsynaptic receptor activation by directly agonizing the postsynaptic receptors in lieu of serotonin. However, in contrast to SRAs, 5-HT1A receptor agonists do not bypass the inhibitory effect of 5-HT1A receptors located as heteroreceptors in non-serotonergic synapses where 5-HT1A postsynaptic receptors are not present, which, instead of serotonin, modulate the release of other neurotransmitters such as dopamine or glutamate. The therapeutic consequences of this difference, if any, are unknown. The distribution of 5-HT1A receptors in the human brain may be imaged with the positron emission tomography using the radioligand [11C] WAY-100,635. For example, one study has found increased 5-HT1A binding in type 2 diabetes. Another PET study found a negative correlation between the amount of 5-HT1A binding in the raphe nuclei, hippocampus and neocortex and a self-reported tendency to have spiritual experiences. Labeled with tritium, WAY-100,635 may also be used in autoradiography. The 5-HT1A receptor is coded by the HTR1A gene. There are several human polymorphisms associated with this gene. A 2007 review listed 27 single nucleotide polymorphisms (SNP). The most investigated SNPs are C-1019G (rs6295), C-1018G, Ile28Val (rs1799921), Arg219Leu (rs1800044), and Gly22Ser (rs1799920). Some of the other SNPs are Pro16Leu, Gly272Asp, and the synonymous polymorphism G294A (rs6294). These gene variants have been studied in relation to psychiatric disorders with no definitive results. The 5-HT1A receptor has been shown to interact with brain-derived neurotrophic factor (BDNF), which may play a major role in its regulation of mood and anxiety. The 5-HT1A receptor forms heterodimers with the following receptors: 5-HT7, 5-HT1B, 5-HT1D, GABAB2, GPCR26, LPA1, LPA3, S1P1, S1P3. ^ Gilliam TC, Freimer NB, Kaufmann CA, Powchik PP, Bassett AS, Bengtsson U, Wasmuth JJ (November 1989). "Deletion mapping of DNA markers to a region of chromosome 5 that cosegregates with schizophrenia". Genomics. 5 (4): 940–4. doi:10.1016/0888-7543(89)90138-9. PMC 3154173. PMID 2591972. ^ "Entrez Gene: HTR1A 5-hydroxytryptamine (serotonin) receptor 1A". ^ Ito H, Halldin C, Farde L (1999). "Localization of 5-HT1A receptors in the living human brain using [carbonyl-11C]WAY-100635: PET with anatomic standardization technique". J. Nucl. Med. 40 (1): 102–9. PMID 9935065. ^ a b Glennon RA, Dukat M, Westkaemper RB (2000-01-01). "Serotonin Receptor Subtypes and Ligands". American College of Neurophyscopharmacology. Archived from the original on 21 April 2008. Retrieved 2008-04-11. ^ de Almeida J, Mengod G (2008). "Serotonin 1A receptors in human and monkey prefrontal cortex are mainly expressed in pyramidal neurons and in a GABAergic interneuron subpopulation: implications for schizophrenia and its treatment". J. Neurochem. 107 (2): 488–96. doi:10.1111/j.1471-4159.2008.05649.x. PMID 18761712. ^ a b Dabiré H (1991). "Central 5-hydroxytryptamine (5-HT) receptors in blood pressure regulation". Thérapie. 46 (6): 421–9. PMID 1819150. ^ Ramage AG (April 1991). "The mechanism of the sympathoinhibitory action of urapidil: role of 5-HT1A receptors". Br. J. Pharmacol. 102 (4): 998–1002. doi:10.1111/j.1476-5381.1991.tb12290.x. PMC 1917978. PMID 1855130. ^ Kolassa N, Beller KD, Sanders KH (1989). "Involvement of brain 5-HT1A receptors in the hypotensive response to urapidil". Am. J. Cardiol. 64 (7): 7D–10D. doi:10.1016/0002-9149(89)90688-7. PMID 2569265. ^ Ootsuka Y, Blessing WW (2006). "Activation of 5-HT1A receptors in rostral medullary raphé inhibits cutaneous vasoconstriction elicited by cold exposure in rabbits". Brain Res. 1073–1074: 252–61. doi:10.1016/j.brainres.2005.12.031. PMID 16455061. ^ Rusyniak DE, Zaretskaia MV, Zaretsky DV, DiMicco JA (2007). "3,4-Methylenedioxymethamphetamine- and 8-hydroxy-2-di-n-propylamino-tetralin-induced hypothermia: role and location of 5-hydroxytryptamine 1A receptors". J. Pharmacol. Exp. Ther. 323 (2): 477–87. doi:10.1124/jpet.107.126169. PMID 17702902. ^ Yu Y, Ramage AG, Koss MC (2004). "Pharmacological studies of 8-OH-DPAT-induced pupillary dilation in anesthetized rats". Eur. J. Pharmacol. 489 (3): 207–13. doi:10.1016/j.ejphar.2004.03.007. PMID 15087245. ^ Prow MR, Martin KF, Heal DJ (1996). "8-OH-DPAT-induced mydriasis in mice: a pharmacological characterisation". Eur. J. Pharmacol. 317 (1): 21–8. doi:10.1016/S0014-2999(96)00693-0. PMID 8982715. ^ Fanciullacci M, Sicuteri R, Alessandri M, Geppetti P (March 1995). "Buspirone, but not sumatriptan, induces miosis in humans: relevance for a serotoninergic pupil control". Clin. Pharmacol. Ther. 57 (3): 349–55. doi:10.1016/0009-9236(95)90161-2. PMID 7697953. ^ Cohn JB, Rickels K (1989). "A pooled, double-blind comparison of the effects of buspirone, diazepam and placebo in women with chronic anxiety". Curr Med Res Opin. 11 (5): 304–20. doi:10.1185/03007998909115213. PMID 2649317. ^ a b Cryan JF, Redmond AM, Kelly JP, Leonard BE (1997). "The effects of the 5-HT1A agonist flesinoxan, in three paradigms for assessing antidepressant potential in the rat". Eur Neuropsychopharmacol. 7 (2): 109–14. doi:10.1016/S0924-977X(96)00391-4. PMID 9169298. ^ Parks CL, Robinson PS, Sibille E, Shenk T, Toth M (1998). "Increased anxiety of mice lacking the serotonin1A receptor". Proc. Natl. Acad. Sci. U.S.A. 95 (18): 10734–9. doi:10.1073/pnas.95.18.10734. PMC 27964. PMID 9724773. ^ Kennett GA, Dourish CT, Curzon G (1987). "Antidepressant-like action of 5-HT1A agonists and conventional antidepressants in an animal model of depression". Eur. J. Pharmacol. 134 (3): 265–74. doi:10.1016/0014-2999(87)90357-8. PMID 2883013. ^ Keller MB, Ruwe FJ, Janssens CJ, Sitsen JM, Jokinen R, Janczewski J (February 2005). "Relapse prevention with gepirone ER in outpatients with major depression". J Clin Psychopharmacol. 25 (1): 79–84. doi:10.1097/01.jcp.0000150221.53877.d9. PMID 15643103. ^ Invernizzi RW, Sacchetti G, Parini S, Acconcia S, Samanin R (August 2003). "Flibanserin, a potential antidepressant drug, lowers 5-HT and raises dopamine and noradrenaline in the rat prefrontal cortex dialysate: role of 5-HT(1A) receptors". Br. J. Pharmacol. 139 (7): 1281–8. doi:10.1038/sj.bjp.0705341. PMC 1573953. PMID 12890707. ^ de Paulis T (2007). "Drug evaluation: PRX-00023, a selective 5-HT1A receptor agonist for depression". Curr Opin Investig Drugs. 8 (1): 78–86. PMID 17263189. ^ Greenberg WM, Citrome L (2016). "Pharmacokinetics and Pharmacodynamics of Lurasidone Hydrochloride, a Second-Generation Antipsychotic: A Systematic Review of the Published Literature". Clin Pharmacokinet. 56 (5): 493–503. doi:10.1007/s40262-016-0465-5. PMID 27722855. ^ Stark AD, Jordan S, Allers KA, Bertekap RL, Chen R, Mistry Kannan T, Molski TF, Yocca FD, Sharp T, Kikuchi T, Burris KD (2007). "Interaction of the novel antipsychotic aripiprazole with 5-HT1A and 5-HT 2A receptors: functional receptor-binding and in vivo electrophysiological studies". Psychopharmacology. 190 (3): 373–82. doi:10.1007/s00213-006-0621-y. PMID 17242925. ^ Wheeler Vega JA, Mortimer AM, Tyson PJ (May 2003). "Conventional antipsychotic prescription in unipolar depression, I: an audit and recommendations for practice". J Clin Psychiatry. 64 (5): 568–74. doi:10.4088/JCP.v64n0512. PMID 12755661. Archived from the original on 20 June 2009. ^ Blier P, Abbott FV (January 2001). "Putative mechanisms of action of antidepressant drugs in affective and anxiety disorders and pain" (PDF). J Psychiatry Neurosci. 26 (1): 37–43. PMC 1408043. PMID 11212592. ^ Morley KC, Arnold JC, McGregor IS (June 2005). "Serotonin (1A) receptor involvement in acute 3,4-methylenedioxymethamphetamine (MDMA) facilitation of social interaction in the rat". Prog. Neuropsychopharmacol. Biol. Psychiatry. 29 (5): 648–57. doi:10.1016/j.pnpbp.2005.04.009. PMID 15908091. ^ a b c Thompson MR, Callaghan PD, Hunt GE, Cornish JL, McGregor IS (May 2007). "A role for oxytocin and 5-HT(1A) receptors in the prosocial effects of 3,4 methylenedioxymethamphetamine ("ecstasy")". Neuroscience. 146 (2): 509–14. doi:10.1016/j.neuroscience.2007.02.032. PMID 17383105. ^ Gobbi G, Cassano T, Radja F, Morgese MG, Cuomo V, Santarelli L, Hen R, Blier P (April 2007). "Neurokinin 1 receptor antagonism requires norepinephrine to increase serotonin function". Eur Neuropsychopharmacol. 17 (5): 328–38. doi:10.1016/j.euroneuro.2006.07.004. PMID 16950604. ^ Baker KG, Halliday GM, Hornung JP, Geffen LB, Cotton RG, Törk I (1991). "Distribution, morphology and number of monoamine-synthesizing and substance P-containing neurons in the human dorsal raphe nucleus". Neuroscience. 42 (3): 757–75. doi:10.1016/0306-4522(91)90043-N. PMID 1720227. ^ Lucot JB (February 1994). "Antiemetic effects of flesinoxan in cats: comparisons with 8-hydroxy-2-(di-n-propylamino)tetralin". Eur. J. Pharmacol. 253 (1–2): 53–60. doi:10.1016/0014-2999(94)90756-0. PMID 8013549. ^ Oshima T, Kasuya Y, Okumura Y, Terazawa E, Dohi S (November 2002). "Prevention of nausea and vomiting with tandospirone in adults after tympanoplasty". Anesth. Analg. 95 (5): 1442–5, table of contents. doi:10.1097/00000539-200211000-00063. PMID 12401641. ^ Bardin L, Tarayre JP, Malfetes N, Koek W, Colpaert FC (April 2003). "Profound, non-opioid analgesia produced by the high-efficacy 5-HT(1A) agonist F 13640 in the formalin model of tonic nociceptive pain". Pharmacology. 67 (4): 182–94. doi:10.1159/000068404. PMID 12595749. ^ Colpaert FC (January 2006). "5-HT(1A) receptor activation: new molecular and neuroadaptive mechanisms of pain relief". Curr Opin Investig Drugs. 7 (1): 40–7. PMID 16425670. ^ Blier P, Gobbi G, Haddjeri N, Santarelli L, Mathew G, Hen R (2004). "Impact of substance P receptor antagonism on the serotonin and norepinephrine systems: relevance to the antidepressant/anxiolytic response". J Psychiatry Neurosci. 29 (3): 208–18. PMC 400690. PMID 15173897. ^ a b Li Z, Ichikawa J, Dai J, Meltzer HY (2004). "Aripiprazole, a novel antipsychotic drug, preferentially increases dopamine release in the prefrontal cortex and hippocampus in rat brain". Eur. J. Pharmacol. 493 (1–3): 75–83. doi:10.1016/j.ejphar.2004.04.028. PMID 15189766. ^ Bantick RA, De Vries MH, Grasby PM (2005). "The effect of a 5-HT1A receptor agonist on striatal dopamine release". Synapse. 57 (2): 67–75. doi:10.1002/syn.20156. PMID 15906386. ^ Rollema H, Lu Y, Schmidt AW, Sprouse JS, Zorn SH (2000). "5-HT(1A) receptor activation contributes to ziprasidone-induced dopamine release in the rat prefrontal cortex". Biol. Psychiatry. 48 (3): 229–37. doi:10.1016/S0006-3223(00)00850-7. PMID 10924666. ^ Rollema H, Lu Y, Schmidt AW, Zorn SH (1997). "Clozapine increases dopamine release in prefrontal cortex by 5-HT1A receptor activation". Eur. J. Pharmacol. 338 (2): R3–5. doi:10.1016/S0014-2999(97)81951-6. PMID 9456005. ^ Yoshino T, Nisijima K, Katoh S, Yui K, Nakamura M (April 2002). "Tandospirone potentiates the fluoxetine-induced increases in extracellular dopamine via 5-HT(1A) receptors in the rat medial frontal cortex". Neurochem. Int. 40 (4): 355–60. doi:10.1016/S0197-0186(01)00079-1. PMID 11792466. ^ Chojnacka-Wójcik E, Tatarczyńska E, Gołembiowska K, Przegaliński E (July 1991). "Involvement of 5-HT1A receptors in the antidepressant-like activity of gepirone in the forced swimming test in rats". Neuropharmacology. 30 (7): 711–7. doi:10.1016/0028-3908(91)90178-E. PMID 1681449. ^ Ogren SO, Eriksson TM, Elvander-Tottie E, D'Addario C, Ekström JC, Svenningsson P, Meister B, Kehr J, Stiedl O (2008). "The role of 5-HT(1A) receptors in learning and memory". Behav. Brain Res. 195 (1): 54–77. doi:10.1016/j.bbr.2008.02.023. PMID 18394726. ^ Meltzer HY, Sumiyoshi T (December 2008). "Does stimulation of 5-HT(1A) receptors improve cognition in schizophrenia?". Behav. Brain Res. 195 (1): 98–102. doi:10.1016/j.bbr.2008.05.016. PMID 18707769. ^ Spreitzer H (August 13, 2008). "Neue Wirkstoffe - Lecozotan". Österreichische Apothekerzeitung (in German) (17/2007): 805. ^ de Boer SF, Koolhaas JM (2005). "5-HT1A and 5-HT1B receptor agonists and aggression: a pharmacological challenge of the serotonin deficiency hypothesis". Eur. J. Pharmacol. 526 (1–3): 125–39. doi:10.1016/j.ejphar.2005.09.065. PMID 16310183. ^ Olivier B, Mos J, Rasmussen D (1990). "Behavioural pharmacology of the serenic, eltoprazine". Drug Metabol Drug Interact. 8 (1–2): 31–83. doi:10.1515/DMDI.1990.8.1-2.31. PMID 2091890. ^ Winstanley CA, Theobald DE, Dalley JW, Robbins TW (2005). "Interactions between serotonin and dopamine in the control of impulsive choice in rats: therapeutic implications for impulse control disorders". Neuropsychopharmacology. 30 (4): 669–82. doi:10.1038/sj.npp.1300610. PMID 15688093. ^ Tomkins DM, Higgins GA, Sellers EM (1994). "Low doses of the 5-HT1A agonist 8-hydroxy-2-(di-n-propylamino)-tetralin (8-OH DPAT) increase ethanol intake". Psychopharmacology. 115 (1–2): 173–9. doi:10.1007/BF02244769. PMID 7862892. ^ Müller CP, Carey RJ, Huston JP, De Souza Silva MA (2007). "Serotonin and psychostimulant addiction: focus on 5-HT1A-receptors". Prog. Neurobiol. 81 (3): 133–78. doi:10.1016/j.pneurobio.2007.01.001. PMID 17316955. ^ Carey RJ, DePalma G, Damianopoulos E, Shanahan A, Müller CP, Huston JP (2005). "Evidence that the 5-HT1A autoreceptor is an important pharmacological target for the modulation of cocaine behavioral stimulant effects". Brain Res. 1034 (1–2): 162–71. doi:10.1016/j.brainres.2004.12.012. PMID 15713268. ^ Fernández-Guasti A, Rodríguez-Manzo G (January 1997). "8-OH-DPAT and male rat sexual behavior: partial blockade by noradrenergic lesion and sexual exhaustion". Pharmacol. Biochem. Behav. 56 (1): 111–6. doi:10.1016/S0091-3057(96)00165-7. PMID 8981617. ^ Haensel SM, Slob AK (July 1997). "Flesinoxan: a prosexual drug for male rats". Eur. J. Pharmacol. 330 (1): 1–9. doi:10.1016/S0014-2999(97)00170-2. PMID 9228408. ^ Simon P, Guardiola B, Bizot-Espiard J, Schiavi P, Costentin J (1992). "5-HT1A receptor agonists prevent in rats the yawning and penile erections induced by direct dopamine agonists". Psychopharmacology. 108 (1–2): 47–50. doi:10.1007/BF02245284. PMID 1357709. ^ Millan MJ, Perrin-Monneyron S (1997). "Potentiation of fluoxetine-induced penile erections by combined blockade of 5-HT1A and 5-HT1B receptors". Eur. J. Pharmacol. 321 (3): R11–3. doi:10.1016/S0014-2999(97)00050-2. PMID 9085055. ^ Ebenezer IS, Arkle MJ, Tite RM (2007). "8-Hydroxy-2-(di-n-propylamino)-tetralin inhibits food intake in fasted rats by an action at 5-HT1A receptors". Methods Find Exp Clin Pharmacol. 29 (4): 269–72. doi:10.1358/mf.2007.29.4.1075362. PMID 17609739. ^ Monti JM, Jantos H (1992). "Dose-dependent effects of the 5-HT1A receptor agonist 8-OH-DPAT on sleep and wakefulness in the rat". J Sleep Res. 1 (3): 169–175. doi:10.1111/j.1365-2869.1992.tb00033.x. PMID 10607047. ^ Ansseau M, Pitchot W, Gonzalez Moreno A, Wauthy J, Papart P (2004). "Pilot study of flesinoxan, a 5-HT1A agonist, in major depression: Effects on sleep REM latency and body temperature". Human Psychopharmacology: Clinical and Experimental. 8 (4): 279–283. doi:10.1002/hup.470080407. Archived from the original on 2012-12-17. ^ Meyer LC, Fuller A, Mitchell D (February 2006). "Zacopride and 8-OH-DPAT reverse opioid-induced respiratory depression and hypoxia but not catatonic immobilization in goats". Am. J. Physiol. Regul. Integr. Comp. Physiol. 290 (2): R405–13. doi:10.1152/ajpregu.00440.2005. PMID 16166206. ^ a b Van de Kar LD, Levy AD, Li Q, Brownfield MS (1998). "A comparison of the oxytocin and vasopressin responses to the 5-HT1A agonist and potential anxiolytic drug alnespirone (S-20499)". Pharmacol. Biochem. Behav. 60 (3): 677–83. doi:10.1016/S0091-3057(98)00025-2. PMID 9678651. ^ a b Lorens SA, Van de Kar LD (1987). "Differential effects of serotonin (5-HT1A and 5-HT2) agonists and antagonists on renin and corticosterone secretion". Neuroendocrinology. 45 (4): 305–10. doi:10.1159/000124754. PMID 2952898. ^ Koenig JI, Gudelsky GA, Meltzer HY (1987). "Stimulation of corticosterone and beta-endorphin secretion in the rat by selective 5-HT receptor subtype activation". Eur. J. Pharmacol. 137 (1): 1–8. doi:10.1016/0014-2999(87)90175-0. PMID 2956114. ^ Pitchot W, Wauthy J, Legros JJ, Ansseau M (March 2004). "Hormonal and temperature responses to flesinoxan in normal volunteers: an antagonist study". Eur Neuropsychopharmacol. 14 (2): 151–5. doi:10.1016/S0924-977X(03)00108-1. PMID 15013031. ^ Navinés R, Martín-Santos R, Gómez-Gil E, Martínez de Osaba MJ, Gastó C (December 2008). "Interaction between serotonin 5-HT1A receptors and beta-endorphins modulates antidepressant response". Prog. Neuropsychopharmacol. Biol. Psychiatry. 32 (8): 1804–9. doi:10.1016/j.pnpbp.2008.07.021. PMID 18725263. ^ a b c Hjorth S, Bengtsson HJ, Kullberg A, Carlzon D, Peilot H, Auerbach SB (2000). "Serotonin autoreceptor function and antidepressant drug action". J. Psychopharmacol. (Oxford). 14 (2): 177–85. doi:10.1177/026988110001400208. PMID 10890313. ^ Briley M, Moret C (1993). "Neurobiological mechanisms involved in antidepressant therapies". Clin Neuropharmacol. 16 (5): 387–400. doi:10.1097/00002826-199310000-00002. PMID 8221701. ^ Starr KR, Price GW, Watson JM, Atkinson PJ, Arban R, Melotto S, Dawson LA, Hagan JJ, Upton N, Duxon MS (2007). "SB-649915-B, a novel 5-HT1A/B autoreceptor antagonist and serotonin reuptake inhibitor, is anxiolytic and displays fast onset activity in the rat high light social interaction test". Neuropsychopharmacology. 32 (10): 2163–72. doi:10.1038/sj.npp.1301341. PMID 17356576. ^ Rothman RB, Baumann MH (2006). "Therapeutic potential of monoamine transporter substrates". Curr Top Med Chem. 6 (17): 1845–59. doi:10.2174/156802606778249766. PMID 17017961. ^ a b Scorza C, Silveira R, Nichols DE, Reyes-Parada M (July 1999). "Effects of 5-HT-releasing agents on the extracellullar hippocampal 5-HT of rats. Implications for the development of novel antidepressants with a short onset of action". Neuropharmacology. 38 (7): 1055–61. doi:10.1016/S0028-3908(99)00023-4. PMID 10428424. ^ Marona-Lewicka D, Nichols DE (July 1998). "Drug discrimination studies of the interoceptive cues produced by selective serotonin uptake inhibitors and selective serotonin releasing agents". Psychopharmacology. 138 (1): 67–75. doi:10.1007/s002130050646. PMID 9694528. Archived from the original on 2002-01-12. Retrieved 2009-07-05. ^ Pike VW, McCarron JA, Lammerstma AA, Hume SP, Poole K, Grasby PM, Malizia A, Cliffe IA, Fletcher A, Bench CJ (1995). "First delineation of 5-HT1A receptors in human brain with PET and [11C]WAY-100635". Eur. J. Pharmacol. 283 (1–3): R1–3. doi:10.1016/0014-2999(95)00438-Q. PMID 7498295. ^ Price JC, Kelley DE, Ryan CM, Meltzer CC, Drevets WC, Mathis CA, Mazumdar S, Reynolds CF (2002). "Evidence of increased serotonin-1A receptor binding in type 2 diabetes: a positron emission tomography study". Brain Res. 927 (1): 97–103. doi:10.1016/S0006-8993(01)03297-8. PMID 11814436. ^ Borg J, Andrée B, Soderstrom H, Farde L (November 2003). "The serotonin system and spiritual experiences". Am J Psychiatry. 160 (11): 1965–9. doi:10.1176/appi.ajp.160.11.1965. PMID 14594742. ^ Burnet PW, Eastwood SL, Harrison PJ (1997). "[3H]WAY-100635 for 5-HT1A receptor autoradiography in human brain: a comparison with [3H]8-OH-DPAT and demonstration of increased binding in the frontal cortex in schizophrenia". Neurochem. Int. 30 (6): 565–74. doi:10.1016/S0197-0186(96)00124-6. PMID 9152998. ^ a b c d e f g h i j k l m n o p q r Ray TS (2010). "Psychedelics and the human receptorome". PLoS ONE. 5 (2): e9019. doi:10.1371/journal.pone.0009019. PMC 2814854. PMID 20126400. ^ Russo EB, Burnett A, Hall B, Parker KK (August 2005). "Agonistic properties of cannabidiol at 5-HT1a receptors". Neurochemical Research. 30 (8): 1037–43. doi:10.1007/s11064-005-6978-1. PMID 16258853. ^ Winter JC, Timineri D (March 1999). "The discriminative stimulus properties of EGb 761, an extract of Ginkgo biloba". Pharmacology Biochemistry and Behavior. 62 (3): 543–7. doi:10.1016/S0091-3057(98)00190-7. PMID 10080249. ^ Manzoni, Olivier Jacques; Ray, Thomas S. (2010). "Psychedelics and the Human Receptorome". PLoS ONE. 5 (2): e9019. doi:10.1371/journal.pone.0009019. ISSN 1932-6203. PMC 2814854. PMID 20126400. ^ Winsauer PJ, Rodriguez FH, Cha AE, Moerschbaecher JM (January 1999). "Full and partial 5-HT1A receptor agonists disrupt learning and performance in rats" (PDF). J. Pharmacol. Exp. Ther. 288 (1): 335–47. PMID 9862788. ^ Ignarro, Louis J. (June 2008). "Different Pharmacological Properties of Two Enantiomers in a Unique β-Blocker, Nebivolol". Cardiovascular Therapeutics. 26 (2): 115–134. doi:10.1111/j.1527-3466.2008.00044.x. ISSN 1755-5914. PMID 18485134. ^ a b c Drago A, Ronchi DD, Serretti A (August 2008). "5-HT1A gene variants and psychiatric disorders: a review of current literature and selection of SNPs for future studies". Int. J. Neuropsychopharmacol. 11 (5): 701–21. doi:10.1017/S1461145707008218. PMID 18047755. ^ Wu S, Comings DE (June 1999). "A common C-1018G polymorphism in the human 5-HT1A receptor gene". Psychiatr. Genet. 9 (2): 105–6. doi:10.1097/00041444-199906000-00010. PMID 10412191. ^ Anttila S, Huuhka K, Huuhka M, Rontu R, Hurme M, Leinonen E, Lehtimäki T (2007). "Interaction between 5-HT1A and BDNF genotypes increases the risk of treatment-resistant depression". J Neural Transm. 114 (8): 1065–8. doi:10.1007/s00702-007-0705-9. PMID 17401528. ^ Guiard BP, David DJ, Deltheil T, Chenu F, Le Maître E, Renoir T, Leroux-Nicollet I, Sokoloff P, Lanfumey L, Hamon M, Andrews AM, Hen R, Gardier AM (2008). "Brain-derived neurotrophic factor-deficient mice exhibit a hippocampal hyperserotonergic phenotype". Int. J. Neuropsychopharmacol. 11 (1): 79–92. doi:10.1017/S1461145707007857. PMID 17559709. ^ Renner U, Zeug A, Woehler A, Niebert M, Dityatev A, Dityateva G, Gorinski N, Guseva D, Abdel-Galil D, Fröhlich M, Döring F, Wischmeyer E, Richter DW, Neher E, Ponimaskin EG (2012). "Heterodimerization of serotonin receptors 5-HT1A and 5-HT7 differentially regulates receptor signalling and trafficking". J. Cell Sci. 125 (Pt 10): 2486–99. doi:10.1242/jcs.101337. PMID 22357950. ^ Salim K, Fenton T, Bacha J, Urien-Rodriguez H, Bonnert T, Skynner HA, Watts E, Kerby J, Heald A, Beer M, McAllister G, Guest PC (May 2002). "Oligomerization of G-protein-coupled receptors shown by selective co-immunoprecipitation". J. Biol. Chem. 277 (18): 15482–5. doi:10.1074/jbc.M201539200. PMID 11854302.
el Mestikawy S, Fargin A, Raymond JR, Gozlan H, Hnatowich M (1991). "The 5-HT1A receptor: an overview of recent advances". Neurochem. Res. 16 (1): 1–10. doi:10.1007/BF00965820. PMID 2052135. Hensler JG (2003). "Regulation of 5-HT1A receptor function in brain following agonist or antidepressant administration". Life Sci. 72 (15): 1665–82. doi:10.1016/S0024-3205(02)02482-7. PMID 12559389. Van Oekelen D, Luyten WH, Leysen JE (2003). "5-HT2A and 5-HT2C receptors and their atypical regulation properties". Life Sci. 72 (22): 2429–49. doi:10.1016/S0024-3205(03)00141-3. PMID 12650852. Lesch KP, Gutknecht L (2004). "Focus on The 5-HT1A receptor: emerging role of a gene regulatory variant in psychopathology and pharmacogenetics". Int. J. Neuropsychopharmacol. 7 (4): 381–5. doi:10.1017/S1461145704004845. PMID 15683551. Kalipatnapu S, Chattopadhyay A (2005). "Membrane protein solubilization: recent advances and challenges in solubilization of serotonin1A receptors". IUBMB Life. 57 (7): 505–12. doi:10.1080/15216540500167237. PMID 16081372. Varrault A, Bockaert J, Waeber C (1992). "Activation of 5-HT1A receptors expressed in NIH-3T3 cells induces focus formation and potentiates EGF effect on DNA synthesis". Mol. Biol. Cell. 3 (9): 961–9. doi:10.1091/mbc.3.9.961. PMC 275657. PMID 1330092. Levy FO, Gudermann T, Perez-Reyes E, Birnbaumer M, Kaumann AJ, Birnbaumer L (1992). "Molecular cloning of a human serotonin receptor (S12) with a pharmacological profile resembling that of the 5-HT1D subtype". J. Biol. Chem. 267 (11): 7553–62. PMID 1559993. Melmer G, Sherrington R, Mankoo B, Kalsi G, Curtis D, Gurling HM (1991). "A cosmid clone for the 5HT1A receptor (HTR1A) reveals a TaqI RFLP that shows tight linkage to dna loci D5S6, D5S39, and D5S76". Genomics. 11 (3): 767–9. doi:10.1016/0888-7543(91)90088-V. PMID 1685484. Parks CL, Chang LS, Shenk T (1991). "A polymerase chain reaction mediated by a single primer: cloning of genomic sequences adjacent to a serotonin receptor protein coding region". Nucleic Acids Res. 19 (25): 7155–60. doi:10.1093/nar/19.25.7155. PMC 332551. PMID 1766875. Gilliam TC, Freimer NB, Kaufmann CA, Powchik PP, Bassett AS, Bengtsson U, Wasmuth JJ (1989). "Deletion mapping of DNA markers to a region of chromosome 5 that cosegregates with schizophrenia". Genomics. 5 (4): 940–4. doi:10.1016/0888-7543(89)90138-9. PMC 3154173. PMID 2591972. Kobilka BK, Frielle T, Collins S, Yang-Feng T, Kobilka TS, Francke U, Lefkowitz RJ, Caron MG (1987). "An intronless gene encoding a potential member of the family of receptors coupled to guanine nucleotide regulatory proteins". Nature. 329 (6134): 75–9. doi:10.1038/329075a0. PMID 3041227. Fargin A, Raymond JR, Lohse MJ, Kobilka BK, Caron MG, Lefkowitz RJ (1988). "The genomic clone G-21 which resembles a beta-adrenergic receptor sequence encodes the 5-HT1A receptor". Nature. 335 (6188): 358–60. doi:10.1038/335358a0. PMID 3138543. Nakhai B, Nielsen DA, Linnoila M, Goldman D (1995). "Two naturally occurring amino acid substitutions in the human 5-HT1A receptor: glycine 22 to serine 22 and isoleucine 28 to valine 28". Biochem. Biophys. Res. Commun. 210 (2): 530–6. doi:10.1006/bbrc.1995.1692. PMID 7755630. Aune TM, McGrath KM, Sarr T, Bombara MP, Kelley KA (1993). "Expression of 5HT1a receptors on activated human T cells. Regulation of cyclic AMP levels and T cell proliferation by 5-hydroxytryptamine". J. Immunol. 151 (3): 1175–83. PMID 8393041. Parks CL, Shenk T (1996). "The serotonin 1a receptor gene contains a TATA-less promoter that responds to MAZ and Sp1". J. Biol. Chem. 271 (8): 4417–30. doi:10.1074/jbc.271.8.4417. PMID 8626793. Stockmeier CA, Shapiro LA, Dilley GE, Kolli TN, Friedman L, Rajkowska G (1998). "Increase in serotonin-1A autoreceptors in the midbrain of suicide victims with major depression-postmortem evidence for decreased serotonin activity". J. Neurosci. 18 (18): 7394–401. doi:10.1523/JNEUROSCI.18-18-07394.1998. PMID 9736659. Kawanishi Y, Harada S, Tachikawa H, Okubo T, Shiraishi H (1998). "Novel mutations in the promoter and coding region of the human 5-HT1A receptor gene and association analysis in schizophrenia". Am. J. Med. Genet. 81 (5): 434–9. doi:10.1002/(SICI)1096-8628(19980907)81:5<434::AID-AJMG13>3.0.CO;2-D. PMID 9754630. Salim K, Fenton T, Bacha J, Urien-Rodriguez H, Bonnert T, Skynner HA, Watts E, Kerby J, Heald A, Beer M, McAllister G, Guest PC (2002). "Oligomerization of G-protein-coupled receptors shown by selective co-immunoprecipitation". J. Biol. Chem. 277 (18): 15482–5. doi:10.1074/jbc.M201539200. PMID 11854302. Panesar, Kiran. "5-HT1A Receptors in Psychopharmacology". Web Article. Psychopharmacology Institute. Retrieved 11 April 2013. Wikimedia Commons has media related to 5-HT1A receptor. "5-HT1A". IUPHAR Database of Receptors and Ion Channels. International Union of Basic and Clinical Pharmacology. 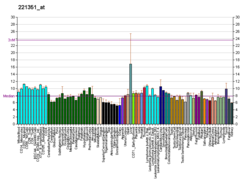 Human HTR1A genome location and HTR1A gene details page in the UCSC Genome Browser.